Welcome to The Old Piggery. 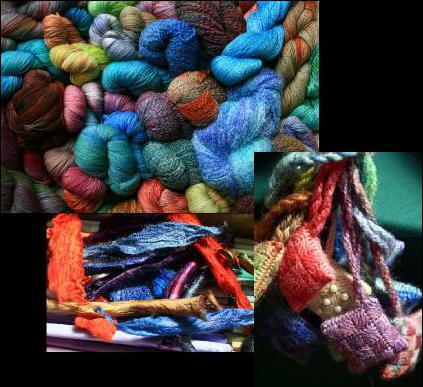 Hand dyed yarns, kits and hand made bags. I am going to be updating the website over the next few weeks, so please come back and have a look. Some yarns & kits may appear to be "out of stock", but I probably have them, please phone or email me for availability. My yarn, kits,bags and other stock is available in La Mercerie yarn shop, Penny Lane, Cowbridge, open Tuesday to Sat 10.00 til 5.00. I started dying as a result of doing my City & Guilds Creative Embroidery course, and have continued from that. All items I sell I hand dye in my small workroom in Wales. I often have lots more colours than listed on the website ( as I'm always trying new colours) , so please contact me for any colour that is not listed as I may have some. As the majority of my products are hand dyed, no 2 are the same, this is the beauty of working with hand dyed textiles. If you want matching skeins, I'm happy to dye them so they are all from a matching "batch". If you have a guild or group that meet , I'd be happy to visit you with my "shop", please contact me.